A: Your panes will be treated by a team of licensed and police-checked window cleaning specialists. Q: What services does window cleaning Thornton Heath cover? A: The experts will perform exterior window cleaning with the help of present-day water-fed pole technology on the market. For buildings above the fourth storey, we'll dispatch practiced abseilers for rope access window cleaning. For internal pane polish, the team will use standard ladders and squeegees. 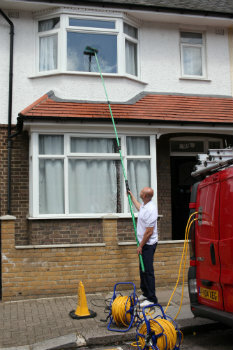 A: A handful of raindrops won't sabotage the Thornton Heath window cleaners' work – rainwater is usually mud-free. However, if we face a downpour, then we will kindly ask you to re-schedule your appointment for another day. A: Yes, any PVC or UPVC frames and sills that your building features will be cleaned free of charge as part of our service. Q: Can you carry out your service in my absence? A: As long as the specialists can pass through your front gate, they can rinse away all grime without you having to be present. If your panes need a proper inside polish as well, then we'll carry out a quick key pick-up and delivery service. A: Usually, the purified water storage inside the team's cleaning vehicle is always full. In case the tank is empty and with your approval, the technicians can effortlessly link the water-fed rod to any available water source. Q: Do I need to meet any special preconditions before the team knocks on my door? A: Once we inform you that the team's en route, you'll need to make sure that they can enter your property unimpeded. In addition, the specialists will need a parking slot within 30 metres from your property and on the same side of the casements you want treated. A: If the team is nowhere to be seen because of intense traffic, we will tell you about the setback and call you as soon as they arrive. For the last ten years, our window cleaning Thornton Heath service has always delivered efficient results at the most fair prices in your district. You can find our prices in our convenient price table below. According to your needs, our window cleaning Thornton Heath can supply you with three choices. If you pick exterior cleaning, the experts will utilize a special water-fed pole. This equipment can stretch up to 22 metres in length, which is equivalent to the height of a four-storey property. The Thornton Heath window cleaners will use distilled water under high pressure that will wash away all stains in almost no time. If you have a high-rise property instead, then opt for our rope access window cleaning. There, a team of approved abseilers will diligently clean your windows until they witness the mirror image of the setting sun. For your ease of mind, we maintain the washing equipment on a regular basis and can provide COSHH records at your request. For interior washing, the specialists will use ladders and squeegees to ensure that even the highest spots will get proper treatment. As we garnered more and more positive reviews from our clients, the need for window cleaning in Thornton Heath has noticeably skyrocketed in adjacent areas. You can check the locations we've included in the list below. For those of you who'd rather book window cleaning services Thornton Heath CR7 online, fill in our get a free instant quote form.